We’re kicking off February with some pretty awesome product announcements. We rolled out a simple way to automatically rotate ads based on metrics, make campaign optimizations using custom conversion data, and more! Read up on all the latest and greatest February Automate releases below👇. We’re very excited to announce the newest Automate feature, Rotations! Automatically update creative or test ad variations to ensure your creatives don’t get stale. 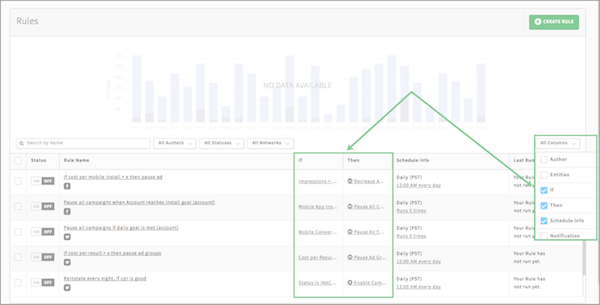 To get started, simply choose the set of campaigns, ad groups or ads you wish to cycle, then select the conditions you want to trigger the rotation. Drop Poor Performers: Rotate ads out once they have 30,000 impressions and their CTR has dropped below your target. Test Targeting: Rotate between multiple LinkedIn campaigns, Facebook ad sets or Twitter cards to test the impact of using different targeting techniques. How do I use Automate Rotations? We’ve added support for Facebook, LinkedIn, and AdStage Custom Conversions metrics to Automate, so you can optimize campaigns to your internal business metrics like revenue. Create optimization rules or alerts based on your own uploaded data such as custom conversion count, value, rate, ROAS or cost per value to drive more revenue. Monitor KPIs for Acquiring New Leads: Create an ad set alert that fires when Cost Per [Demo Requested] >$50 AND [Demo Requested] > 10. Browse and Apply Pre-Built Alerts, Bulk Actions, Rules, Schedules, Rotations and more! We’ve added a new section to Automate called Templates. Templates feature a gallery of pre-built email alerts and optimization rules made directly from top advertisers for advertisers which can be edited and applied quickly to your accounts. When viewing your list of Alerts, Bulk Actions, Rotations, Rules and Scheduling, add IF/THEN columns from the column selector to see the conditions and actions associated with your optimization rules. ✅ Improved Action Log when viewing 'Before' and 'After' changes. ✅ Updated the Business/Dayparting Schedule to show only one time range, instead of individual time ranges for each day of the week. ✅ Choose a Rotations by Metric Template from the Templates gallery.